It’s that time of year again, a time to reflect on the books that have left their mark on us. Books that will, over time and with luck, leave their mark on society as well. I polled our contributors to see what books they’ll remember best from 2017. And here we have it — a selection of children’s books and adult fiction and nonfiction — some of which we’ve reviewed and some of which we hope to still. 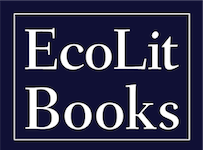 A word of thanks — to our contributors, for reading and reviewing books that make a difference; to the authors of these books that inspire us to make the world a better place; and to the readers who make what we do worthwhile. Me and Marvin Gardens by Amy Sarig King. 2017. 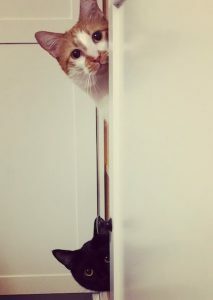 Moto and Me: My Year as a Wildcat’s Foster Mom by Suzi Eszterhas. 2017. Lesser Spotted Animals: The Coolest Creatures You’ve Never Heard Of by Martin Brown. 2017. It’s difficult to think of a title more important to the oceans—and therefore to the earth’s entire ecosystem—than Jonathan Balcombe’s New York Times bestseller What a Fish Knows. Not only does Balcombe introduce us to the fascinating, complex lives of these sentient creatures, he shows us how devastatingly we are treating them, to the point of endangerment and extinction. Each section in this book is more interesting and engaging than the last, with information on the habits, abilities, and perceptions of many of the 30,000 species of fishes in our waters. 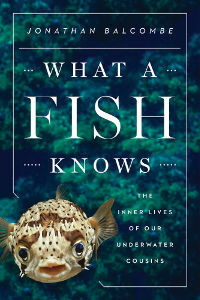 What a Fish Knows is a powerful, accessible book that will ensure that we never look at a fish the same way again. At the heart of neuroscientist Gregory Berns’ newest book is this question: Do animals experience emotions like people do? The answer, garnered through ground-breaking studies of the brains of domestic and wild animals, should fundamentally reshape how we think about—and treat—animals. If you felt like your life was breaking apart, where would you go to try to put it back together? If you’re thirty-year-old Cooper Gosling, you’d go to the South Pole. For a year. Gosling is the central character in this wry, compelling story of relationships, art, science, climate change, and life at the bottom of the earth. 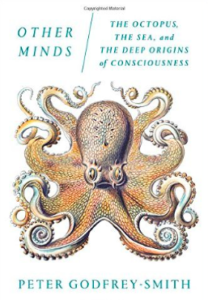 Peter Godfrey-Smith has a passion for cephalopods, And by the end of this book I suspect most readers will as well. The tragic true story of early Australian hubris and the outback. Spoiler alert: The outback wins. Published in association with the Center for Humans and Nature, this collection of essays explores how people can become attuned to the wild community of life and also contribute to the well-being of the wild places in which we live, work, and play. With this book, we gain insight into what wildness is and could be, as well as how it might be recovered in our lives—and with it, how we might unearth a more profound, wilder understanding of what it means to be human. The Driftless Reader gathers writings, paintings, photographs, and maps that highlight the unique natural and cultural history, landscape, and literature of the Driftless Area—a region that encompasses southwestern Wisconsin and adjacent Minnesota, Iowa, and Illinois. Through texts by Black Hawk, Mark Twain, Laura Ingalls Wilder, Frank Lloyd Wright, Aldo Leopold, and many others, the book reveals the transformative power of the land and its capacity to make our lives more meaningful. For centuries, poets and philosophers extolled the benefits of a walk in the woods. Intrigued by our storied renewal in the natural world, Florence Williams sets out to uncover the science behind nature’s positive effects on the brain. Delving into new research, she uncovers the powers of the natural world to improve health, promote reflection and innovation, and ultimately strengthen our relationships. 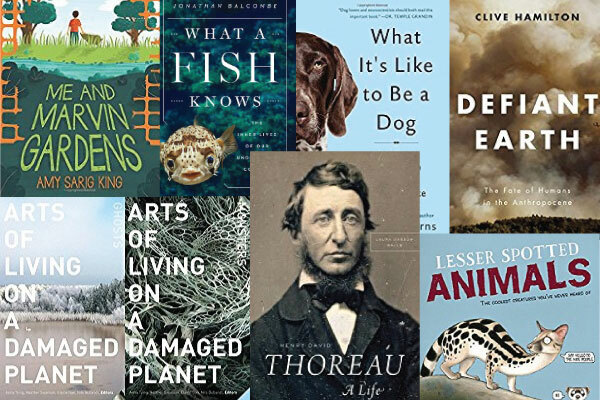 Thoreau has long needed a fresh portrait that looks beyond both mythology and simplistic myth-bashing and recontextualizes him for our time. Walls, a former fellow at the Center for Humans and Nature and one of our finest interdisciplinary scholars, provides it in this meticulously researched biography. A follow-up to his earlier book, If Mayors Ruled the World, Barber’s proposals for transnational governance of climate change have taken on a new importance and urgency now that the American national government is under the control of Donald Trump and a Republican Congress. Responsible action now falls to other levels of government and to the private sector. Acting in concert, cities can have global leverage. A wide-ranging discussion of advanced thinking in ontology, ecology, evolutionary theory, and more by a noted political theorist. What Blake referred to as “Newton’s sleep” is over. Connolly is a demanding but rewarding guide to the new age. Vintage Hamilton. Trenchant, widely-informed, unconcerned about stepping on toes. This book shows the danger of interpreting the Human Epoch once more in anthropocentric terms. An original and sophisticated study of how thinking about water as a resource to be managed was constructed by the disciplines of geology and anthropology beginning in the nineteenth century. His critique offers a new philosophy of water and a rich way of understanding the formation of knowledge-systems more generally as well. There are many ways to read this graphically and intellectually innovative book. It offers creative tools for living in a more-than-human Anthropocene. One half is devoted to landscapes injured by humans in the modern age—Ghosts of the Anthropocene. One half is devoted to essays on interspecies and intraspecies entanglements—Monsters of the Anthropocene.